I train alone, and for some reason, I don’t get bored. As a matter of fact, I rarely get bored at all. I'm of the philosophy 'Only boring people get bored.' (Ruth Burke). I don't know about you, but I find getting stronger and breaking PR's pretty exciting. Workouts are usually always different (add weight to the bar on a weekly basis). And the side effect of continually getting stronger for me has been getting bigger, which is not very boring when passing a full length mirror. Boredom rarely enters my mind. Kaizen, persistence, perseverance, discipline, and other character-building words are in place of boredom. Even with the grind of training, lifting things up and putting them back down, and then lifting it up again and doing the same lifts day in and day out, I’ve manage not to feel bored at all during nearly 2 years of lifting weights (note: 2 years training seriously, many years on and off of screwing around). In some ways, I like to think that my lack of boredom during exercise is attributed to my Shaolin monk-like discipline. But after thinking about it, that’s only a small part of the equation. I’ve realized that it’s probably something I’m doing that’s preventing me from becoming bored in the weight room (in my case now, my home gym). If you asked me if I was going to do a standing overhead press with 225lbs on the bar 2 years ago, I would think you are crazy. I have dislocated my left shoulder when I was a teenager and have had pain in my shoulders from too many pressing exercises when I was younger. Other goals I have are squatting 500lbs (I’m at 462.5lbs right now), deadlifting 600lbs and bench pressing 400lbs. I view my home gym as a lab for my body, and I am the test subject and the mad scientist. The goal: to get stronger. My training routine is quite simple. Tuesdays and Saturdays I’ll work on my neck muscles with the neck harness, and perform reverse hyperextensions. The only “boring” day used to be Wednesday. Following the original Texas method template, I used to do back squat and bench press at 80% of the weight on Monday, and do 3x5 OHP at the same weight as the previous Monday. 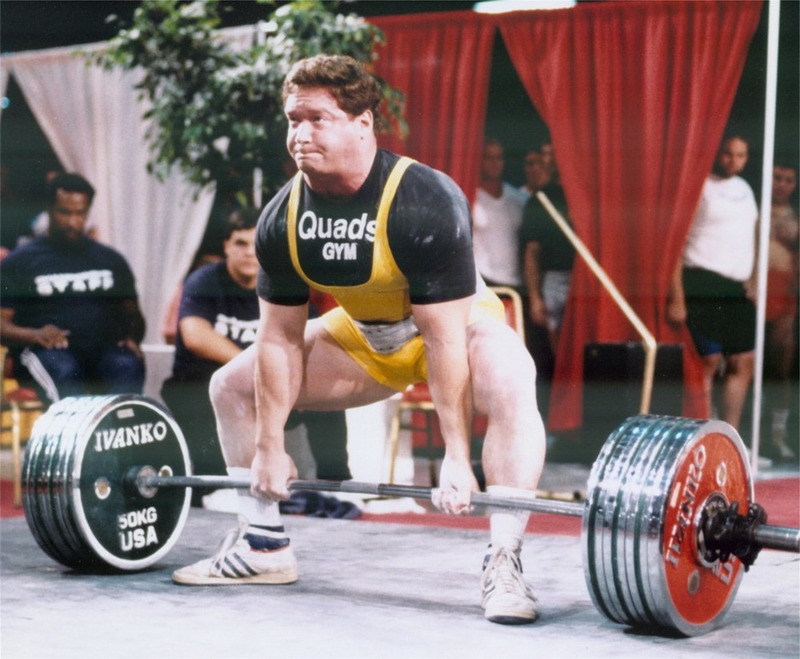 For squats, I’ve consulted with Nick Horton and have previously added the front squat to my Wednesday recovery workout. 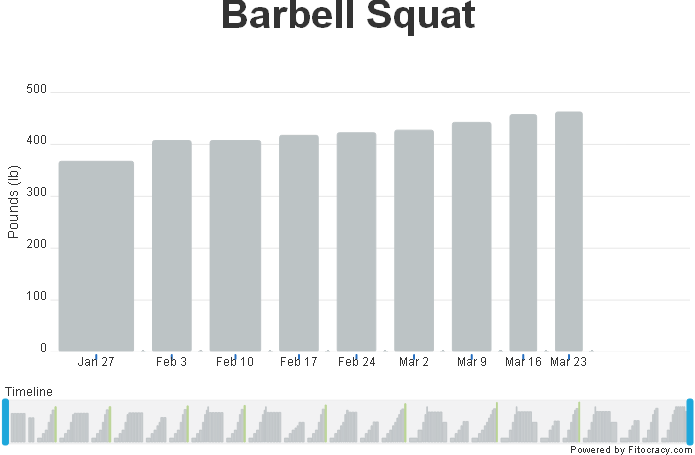 I have since switched over to high bar squats instead of front squats on recovery days. The reason is because the racking position in the front squat is painful on both of my shoulders. Also, I never really done high bar squats before, so I wanted to try it out. I believe you truly never understand something unless you’ve physically experience it. Since I’ve never tried high bar squat before, so I couldn’t really tell you from personal experience about the difference between that and front squat or low bar squat. I’ve replaced bench presses on Wednesday with dips, because in the past, too much benching gives me shoulder pain. Also, I find that weighted dips gives me bigger pecs and triceps than bench pressing alone (at least temporarily from a pump). I’ve also added push presses to the Wednesday recovery workout, which I believe have helped me overhead press 225lbs. This “tweaking” of the Texas Method has kept the program from becoming boring, gotten me excited about figuring out ways I could get stronger, and has attributed to higher strength gains. I’m training to compete in a powerlifting competition (or two) in the next few months. The pressure of wanting to do well on the platform motivates me to push myself harder during training. Powerlifting might not be everyone’s cup of tea. I choose it because I think I may be able to do well, and it’s a relatively simple sport - only 3 different movements! There are other options like competitive sports, extreme obstacle courses like the Spartan race or Tough Mudder to name a few. What brings excitement for me in my basement home gym is testing out new gear. Recently, I’ve upgraded my shoes from the Converse Chuck Taylors to the Nike Romaleos 2, and I can say that it has had a positive effect on my squatting numbers. Bands, chains, and other exercise equipment are in queue for testing in the future. Trying out different supplements to see how effective they are and if they have an effect is something that has worked for me eons ago to get me excited about training, and I’m looking forward to testing again in the near future. For example, one of the things I’ve been pondering over the past few months is if the popular and well researched creatine monohydrate really works for me. How much impact will it make on my lifts? How much weight will I gain? Will creatine really work for me? These questions are intriguing to me, and motivates me to find out the answer through training. Fitocracy is pretty awesome. Essentially it’s like a Facebook for fitness buffs, where the game is to exercise. It’s a social network and workout tracking tool combined into one. 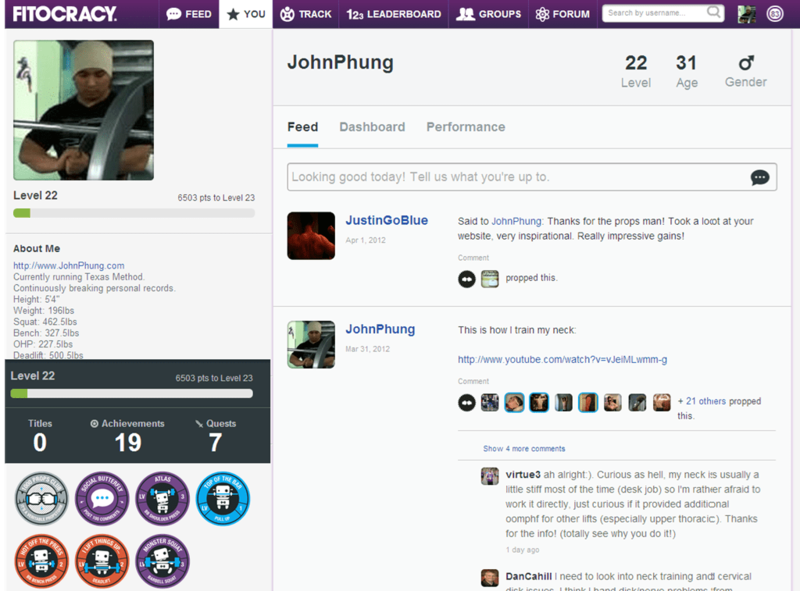 Fitocracy allows you to track your workouts, which is essential if you want to improve and progress. Remember: “If you cannot measure it, you cannot improve it.” - Lord Kelvin. There’s an active and supportive community that will encourage and motivate you to hit your fitness goals, whatever that may be. Unlike most people on Facebook (at least the people on my friend’s list), members of Fitocracy actually exercise! So if your status update is health/fitness related, chances are you’ll get a lot more response on Fitocracy than Facebook. There’s a variety of different people with varying levels of experience. From the absolute beginner who’s just starting to exercise to monsters who are way bigger and stronger than I am. And similar to Facebook’s “Like”, Fitocracy has “Props”. To be honest, it feels good when people prop your workouts and comment on your hard work. Join Fitocracy here and try it out for a few weeks. My name is JohnPhung on there so follow me! Compete with yourself, and make it a continual goal to break your personal bests in your lifts. 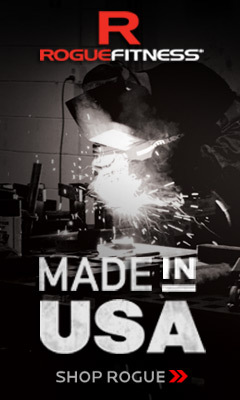 That’s what I do, and so far it has kept me training. There’s no better feeling you can have with your clothes on than to lift a little bit more than last time, even if it’s only 1lb greater than your previous 1 rep max. These are some things that worked for me to beat boredom in the weight room. These tactics allowed me to add excitement to an activity where it’s essentially lifting things up and putting them down, and have allowed me to improve physically AND mentally. Try them out yourself. Lifting weights may get a bit more exciting, and you might just get a little bit bigger and stronger in the long run.